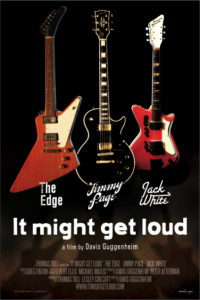 The documentary film It Might Get Loud features Beacon Hill resident Randy Parsons. Massive Monkees, who sometimes drop in at the Jefferson Park community center, demonstrated their dance moves to Beyonce’s “Work It Out” on this week’s episode of America’s Best Dance Crew — with the added bonus of hula hoops. Andrew Matson at the Times is interviewing Beacon Hill’s own Blue Scholars about their new EP OOF! later this week, and to whet your appetite, he’s posted a link to the video for “Coffee and Snow”, filmed and released during last December’s Snowpocalypse. The video features shots of Beacon Avenue, the VA hospital, and possibly the Othello Safeway, all covered in a thick layer of white. What other locations can you spot? Do you have a home security system? Madison Park Blogger has some hard truths about Seattle Police alarm response. Guitar craftsman and Beacon Hill resident Randy Parsons is featured in the new documentary film opening August 28, It Might Get Loud, about guitar icons from three different generations: Jack White, the Edge, and Jimmy Page. Beacon Hill neighbor Tess Martin tells us what the Beacon Hill library branch means to her, on the Friends of the Seattle Public Library blog. There’s been a lot of buzz lately about the new “green” homes on Beacon Hill. The developers, Dwell Development, have several projects in Southeast Seattle. They are definitely a different aesthetic than the typical Beacon Hill house, but interesting. Mike Cheney is looking to create a South Beacon Hill block watch for neighbors in and around New Holly and areas nearby. This effort would be completely unrelated to the Citizens for the 2nd Amendment group or Mike’s own informal neighborhood patrols. Whether you agree or disagree politically, Mike’s aim here is simply to help make Beacon Hill a safer place to live. If you’re interested in helping get a block watch organized, contact Mike: redboneshadow@yahoo.com. Girls on the Run coaches do NOT need to be elite runners. Any woman who lives a healthy lifestyle and is committed to improving the lives of girls can be a GOTR coach. Details at http://www.girlsrun.org/coaching.html. Amber can be reached by phone at 206-528-2118, or by email at amber@girlsrun.org. The deadline to apply is September 4th.